SAN FRANCISCO, CA--(Marketwired - Mar 20, 2014) - Golden Gate University (GGU) unveils a new ad in its aspirational SHINE campaign, this one focusing on active-duty military and veterans. Titled "Duty Calls. So Do Dreams," the single ad focuses on combining military skills with advanced education that can lead to management careers. 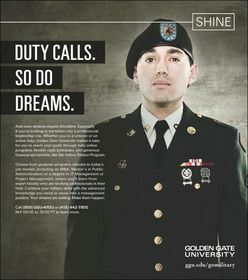 Featuring a decorated soldier, the ad points to GGU's offerings that support military students earning graduate degrees. These include the Yellow Ribbon Program, providing grants of up to $36,000/year for tuition and fees. GGU is in the top 20 percent nationwide of colleges and universities who have committed to this program. The university's programs earned the 2014 Military Friendly School designation, recognizing its military offerings that champion the academic success of service members, veterans and spouses. The ad will appear in Stars and Stripes, a weekly newspaper distributed on U.S. military bases, for six weeks beginning mid-March 2014. The campaign was created by San Francisco's award-winning Mortar Agency. Nearly 60,000 troops are expected to return home by the end of 2014. According to the National Center for Veterans Analysis and Statistics, California is home to nearly 2 million veterans -- more than any other state. And more than 26,000 veterans call the Bay Area home. Recently GGU's School of Law launched a Veterans Legal Advocacy Center seeking to open the profession to veterans and to create programs that both serve law students and support the legal needs of the broader veterans' community. The center offers students specialized courses, scholarships and student-support organizations. GGU's School of Law is also one of the few law schools providing 100 percent scholarships for qualifying military personnel and veterans. More than 125 veterans at GGU are receiving educational benefits from the Veterans Administration. Veterans are represented in GGU's School of Law, Ageno School of Business, Braden School of Taxation, School of Accounting and Undergraduate Programs.